In 1936, poet Muriel Rukeyser and photographer Nancy Naumburg sought to document the Hawk’s Nest tunnel tragedy of Gauley Bridge, West Virginia, where nearly 800 miners died of silicosis, a lung disorder caused by prolonged inhalation of silica dust. The museum will stage a live reading from the resulting book-length-poem “The Book of the Dead” (1938). Poet Susan Briante and Curator of Community Engagement Ariel Goldberg will hold a conversation on the possibilities and problems of social documentary writing and photography. 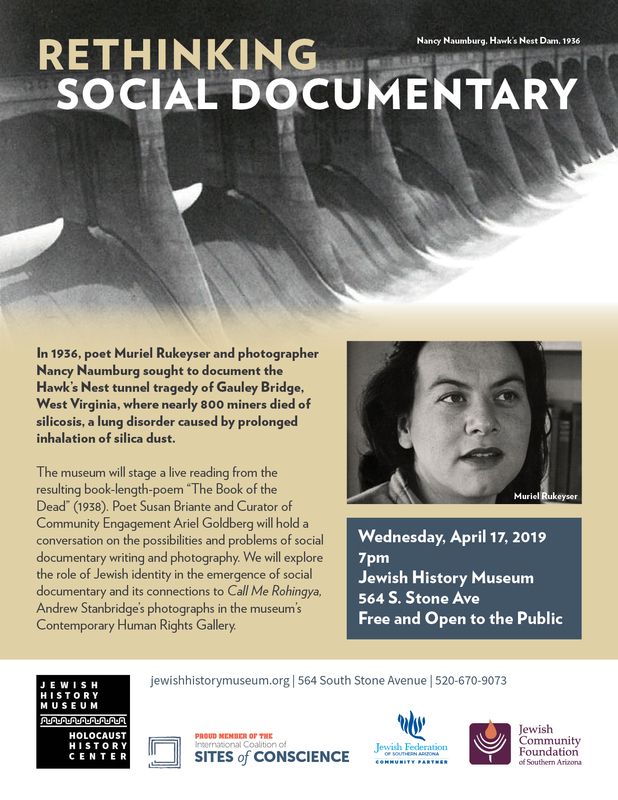 We will explore the role of Jewish identity in the emergence of social documentary and its connections to the photographs of Andrew Stanbridge in the museum’s Contemporary Human Rights Gallery Call Me Rohingya. Photo credit: Nancy Naumburg, "The Book of the Dead"